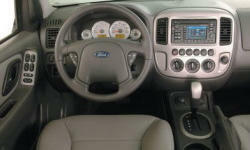 Why the 2007 Ford Escape? Consistantly 30 mpg average fuel economy. Nice for an SUV. Controls are at your fingertips even for a smaller person, easy to use and understand. High clearance, performs well in snow, even with only FWD. Classic style, not that ugly new "modern" look, and not some retro throw back. Ergonomically sleek look. 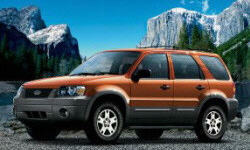 Why Not the 2007 Ford Escape? Only 1000lb towing capacity combined with small cargo space (it is a small SUV) makes it difficult to go camping with two dogs and a toddler. Roof/bike racks are a good option. It is not economical when comparing standard engine vs. hybrid engine. You have to do it because you want a hybrid for the environment. However, it is 10K cheeper than Toyota Highlander Hybrid, but it is a lighter car too. Tow capacity is 1000 vs 3000.